View versatile, interactive graphs of stored data, including a unique trend analysis feature. Show a full-screen plot of the pressure on your computer that updates every minute. Region zoom the graphics to show the slightest change in pressure. Create and access logged entries. Display information on the state of the DUO / DUO+ / STAR. Read and set various parameters (units, time, timezone, etc.). Check or set the DUO / DUO+ / STAR’s high-accuracy internal clock. Check for latest firmware and update it automatically if needed. Connect directly to the DUO / DUO+ / STAR and run commands from the included terminal window (without the need for an external tool). 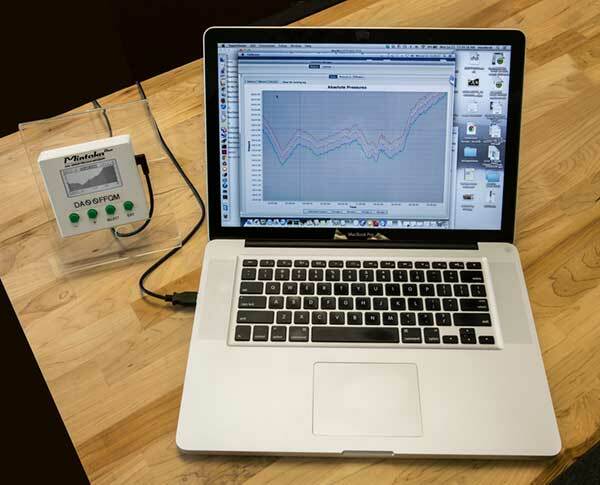 Configure NMEA output to read pressure in other instruments and software programs. The PC version requires Java version 1.8 or later. The latest version is 1.8 and is available from Oracle. With your DUO / DUO+ / STAR connected to the computer with the USB cable, view the browser Downloads folder and run (double click) MintakaCommander. It will open with a window like the one below, along with a notice that it is loading data from the DUO / DUO+ / STAR to the computer. This will a take a few seconds for the first time, depending on how long the instrument has been running, but subsequent sync operations are much faster as it just has to add the new data. Then it will automatically display a graph of the data over the last week. This time period can then be changed as desired. Available barometer controls, readouts, and operations are available from the menu bar. They are outlined below. Export Data. Enter start and end dates or graphically select (click start and end points) a region of data for export to csv file for analysis or archive elsewhere. Delete Data. Enter start and end dates or graphically select a region of data to delete. Valuable since the DUO / DUO+ / STAR stores up to two years of data. Info. Shows current state of the DUO / DUO+ / STAR. See sample. Show Pressure. Displays at the bottom on the page: current time, pressure, sensor temperature, difference between sensors and calibrated difference between sensors. Run a Command. Lets you run any of a number of commands. The command h gives a list of commands. See sample. Read Time. Displays the clock date and time according to the DUO / DUO+ / STAR’s internal clock. Also displays the error relative to computer time along with the time period since it was last set. This assumes the computer has correct time, which is likely the case if it is newish and connected to the Internet. See notes on finding accurate time. Runtime. Shows the total time the DUO / DUO+ / STAR has been running along with the time period since the last power up. Set Time and Time zone. Sets the DUO / DUO+ / STAR to the computer time and time zone. Note it does not ask you to confirm this; it just does it, so best to check the Read Time to see if this is needed. You can adjust the time by a given number of seconds with the command ST, and also set the time zone without changing time with command SZ. See finding accurate time to be sure you need to change it. The DUO / DUO+ / STAR should be a very accurate clock. Connect. Connects the DUO / DUO+ / STAR to your computer via a command or terminal window, active at the bottom of the window. You can issue commands in that window or monitor autosample output. Disconnect. Closes the terminal connection. Synch. Synchronizes the data in the DUO / DUO+ / STAR with that stored in your computer. After the initial sync, only new data will be added. There is also an Auto Sync option on the right-hand side of the menu bar that you can set to any interval that will automatically update the data and display it in the graph for a live display of pressure accumulation. Check for Mintaka DUO™ / DUO+™ / STAR™ Updates. This checks your instrument for latest firmware version and allows an automatic update (connected to Internet) along with a brief note of the changes being added. Check for MintakaCommander Update. Checks online to see if you have the latest version of this app and offers the option to download it. Load Firmware File. This is another way to update the firmware by first downloading the file to your computer then loading it from your computer. Diagnostics. Displays a file of information that could be useful in evaluating the performance of the instrument as needed. About. Displays the version number of the MintakaCommander application. • Region zoom with left click and drag (upper left to lower right). • Right click for zoom options. • Ctrl+left click to drag pan (PC). Option+left click (Mac). • Click a data point to read its value in the status line below the graph. • Click a second point to see change in time and pressure from the last click. 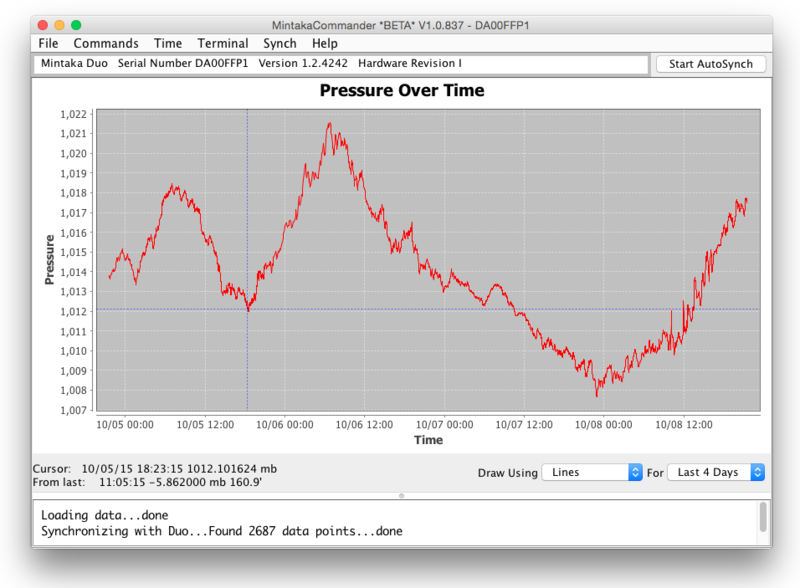 and calibrated pressure difference ‘dp [mm/dd/yy hh:mm:ss qid]’. DPR – Dumps pressure directly from the sensors. Prints pressure, temperature and pressure difference. Note any set/read command will read the values without changing them if no argument is given.